Friday afternoon was the start of the next leg of my "Road to Maniac Membership". I was late leaving work so I got to the gate with just 10 minutes to spare before boarding the flight to Los Angeles, where I would soon be running my third Full Marathon in five months in my attempt to qualify for membership in the Marathon Maniacs Running Club. We landed at LAX airport about 45 minutes late so by the time I picked up my rental car, it was already 5pm. My plan was to drive down to Huntington Beach to pick up my race packet (and use the trip to learn the best way to make the drive). I got there around 6:15pm and got my bib, bought a visor, and a few other things and then headed back to LA to my childhood house where my Dad and sister still live. Then as I was trying on a pair of Skechers GoRun Ride shoes, my sister and brother in law appear. It was so cool to see them, especially since Gwendy is 'with child'! They are both runners too. I went to lunch with them and their friends and shared some good laughs. Until I had to 'literally' run to my car and drive 15 minutes to Newport Beach to meet up with Eddie, Joe, and a couple who came all the way from Ireland to run this race. We took a fun Duffy boat ride with "Captain Joe" at the helm! The next morning (after an evening at my high school reunion), I got geared up and drove back to the Beach for the race! 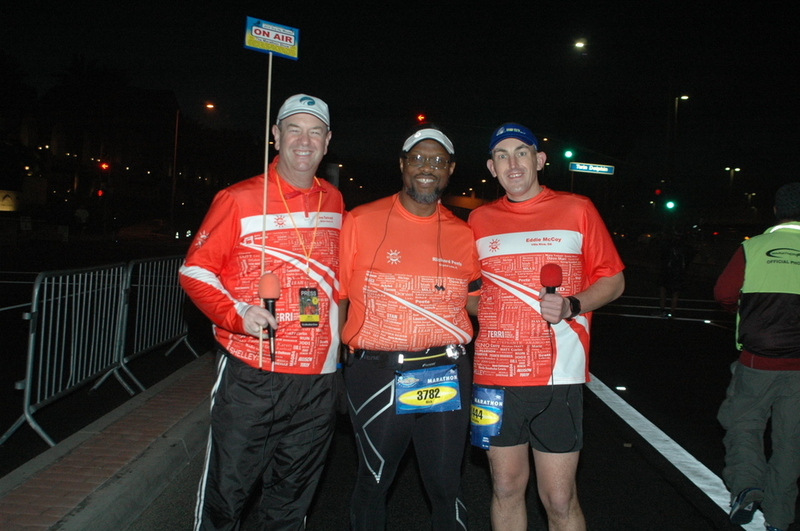 First stop: meeting with Eddie and Joe at the Marathon Maniac pre-race photo op. I met the Prez of the group, Steve Yee, who was very nice as well as other Maniacs. As a Half Fanatic, I was happy to be there because soon enough, I will be one of them (and a Double Agent)! Then Joe, Eddie, and I headed for the corrals. Eddie was going to be broadcasting during the race, like a Marathon Show roving reporter. How cool is that! I took my place in the third corral and waited patiently. I felt good, and I had positive feelings about completing this race. The temp was around 58F so it was brisk and clear. It wasn't long before Rudy started the race and I was off! The first three miles were on the Pacific Coast Highway (PCH) with the beach to my left. This was so different than running on Lake Shore Drive in Chicago! I couldn't help but smile and think "Everybody needs to run out here!" Then we turned right and headed into the neighborhood and eventually through a very nice park. I was running at a good 11:15 average pace and felt good. We hit a good hill at Mile 8 and I powered up the hill. There were only two real 'hills' on this course and they were within the first half of the race when I was still fresh. The course itself is relatively flat with a few rolling inclines along the way. At Mile 10, we returned to PCH and from there on, the beach was always at my left or right side. I enjoyed that view, the smell of the water, and the crowd support was awesome! I saw a lot of great signs (which I can never remember afterwards!) as well as bands. I got a laugh from the guys dressed as bunnies with signs that read "Hop To It!". There were also a lot of bands playing along the course in addition to DJs playing music. The temp rose to about 69F but with the ocean breeze, it was not that bad. There was no real humidity but the sun was definitely hot in the clear sky. I did see surfers out there but not as many as I was expecting (probably due to the cold water temps). I ran into Eddie about 3 different times along the course which was awesome. At Mile 17, he came over and talked with me 'on mic' for a bit. Then about a mile later, Joe Taricani found me and talked to me briefly on video. Pretty cool! 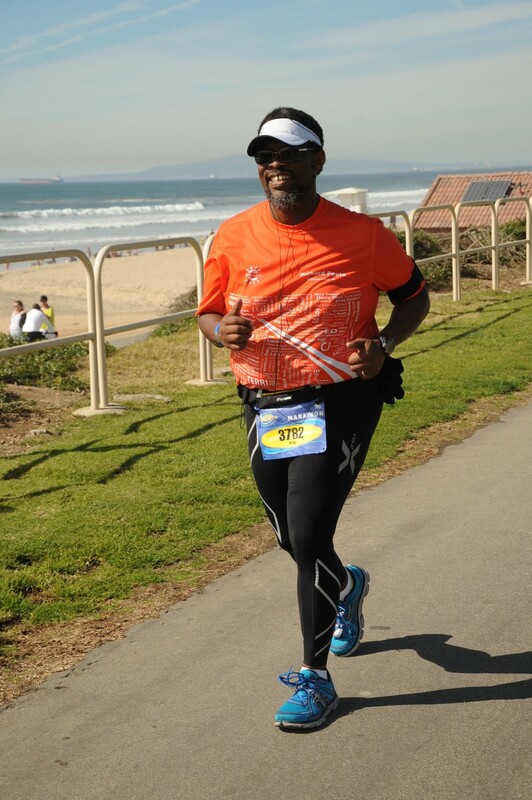 I was maintaining my goal pacing until around Mile 18. Then I started having some spasms in my calves and some hip pain. So I started to stop every now and then to stretch. I have never had a cramp in a race and I didn't want to suffer one today! My pacing slowed down but I kept moving forward. I took some walk breaks (usually after stretching) but I was very aware of my time. One of my goals was to finish this race under 6 hours and earn a new PR for the Full distance. So I was really trying to keep moving to meet that goal. When I got to Mile 24, I knew I had it! I left the beach bike path and entered PCH where I could see down the ways to the Finish Banner! I found new energy! I picked up my pace somehow and willed myself to get this race done! Gwendy and Steve were at Mile 25.5 I think and they were cheering and holding up a nice sign. Gwendy started to run with me but soon decided that wasn't a good idea. So I ran for the finish! Rudy, the Voice of America's Marathon, saw me and shouted out my name and said a few words about me that I cannot remember now. But it made me very happy. Rudy, you are the best! I was so happy when I crossed that Finish Line! First, because it was done! LOL But mostly, because I had finished with a 5:19 minute PR from my previous time at Chicago and had completed the race in 5:57:15 -- a sub 6-hr finish! I wanted that so badly, especially after my slow performance at Disney 3 weeks before (even though that was with good reason). And. this finish means that I am only one more Full Marathon finish away from completing my "Road to Maniac Membership". I know in my heart that this will be a reality when I head to Little Rock on March 3rd. My goal is within my reach now! Yep! Got me some awesome race bling! What a fantastic day! What a great weekend! This is a memory I will cherish for quite some time. Joe Taricani's ON AIR sign with my name listed! The Three Amigos: Joe, me, and Fast Eddie! It's about 5 minutes before Race Start!! There be Bunnies on the road! Aren't you wishing you could be running beside this view? Slow but steady. Check out the view on my right! 2 Miles to go and I can taste that PR!! Hey Rudy! I made it! I am a Finisher, baby! My race statistics and splits. Posted in Marathon, Races, Running and tagged with Races, Marathon, Running. February 6, 2013 by Richard Peete.